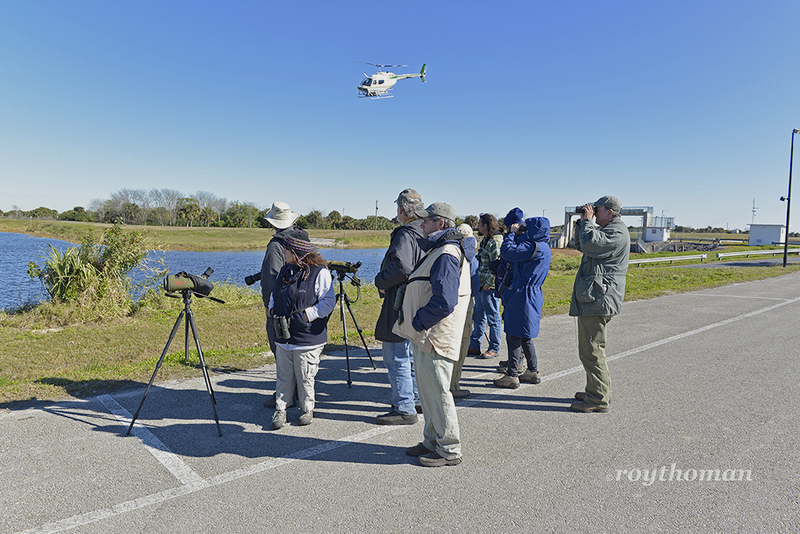 The Space Coast Birding and Wildlife Festival, Where the action is! 2014 Space Coast Birding and Wildlife Festival. 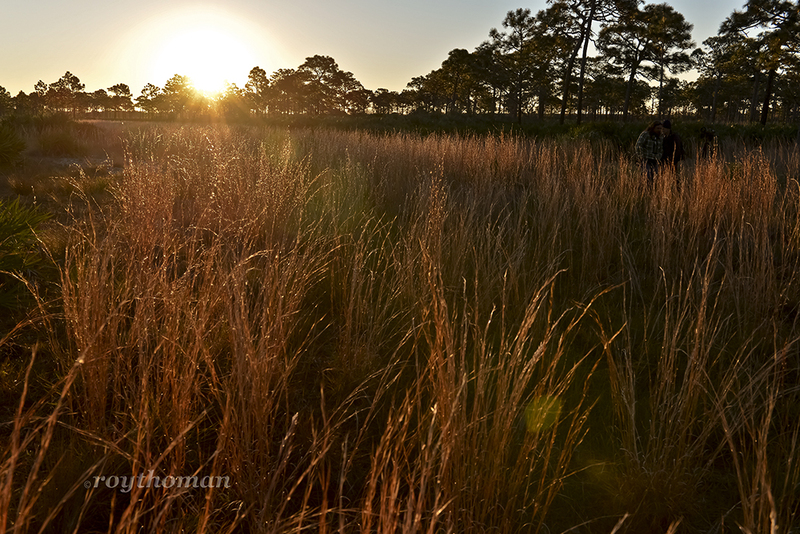 A field trip to St. Sebastian River Preserve State Park. The 17th Annual Space Coast Birding and Wildlife Festival (SCBWF) in Titusville Florida, has grown to be the largest birding festival in the country. The festival is attended by people from all over the country as well as from several other countries. Once again this year, I was asked to photograph events at the festival. I always have fun photographing people taking part in festival activities. The SCBWF has something for everybody. Whether you are a beginning birder, someone who just loves getting outdoors, or a seasoned birder, you will find several festival activities to enjoy. Looking to add that elusive bird to your life list? Sign up for one of the many field trips offered at the festival. 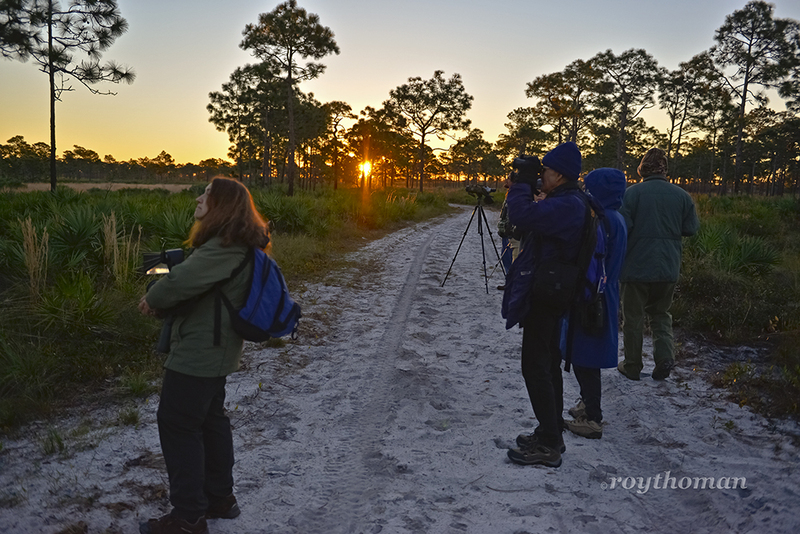 The Red-cockaded Woodpecker and the Florida Scrub-Jay are two birds that many birders would like to add to their life list. 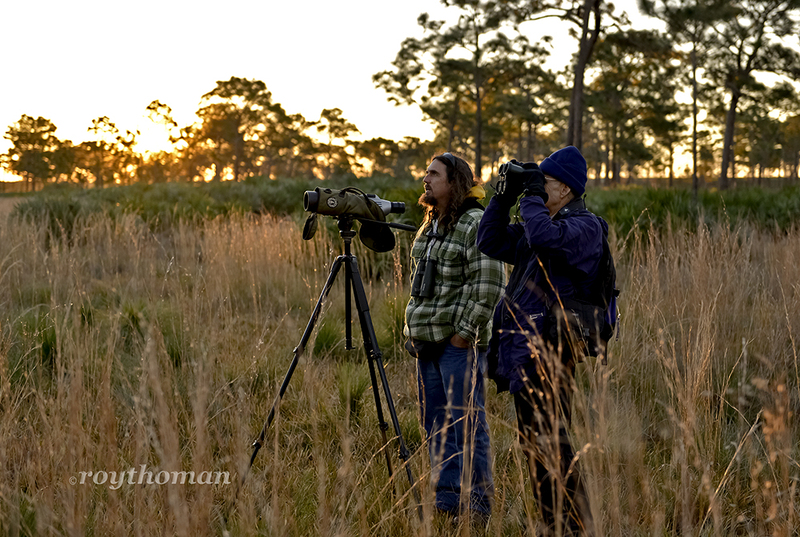 A great place to see both of those birds is at the St. Sebastian River Preserve State Park. If you want to take advantage of this field trip, you will need to wake up early! The bus boards at 4:30 am! 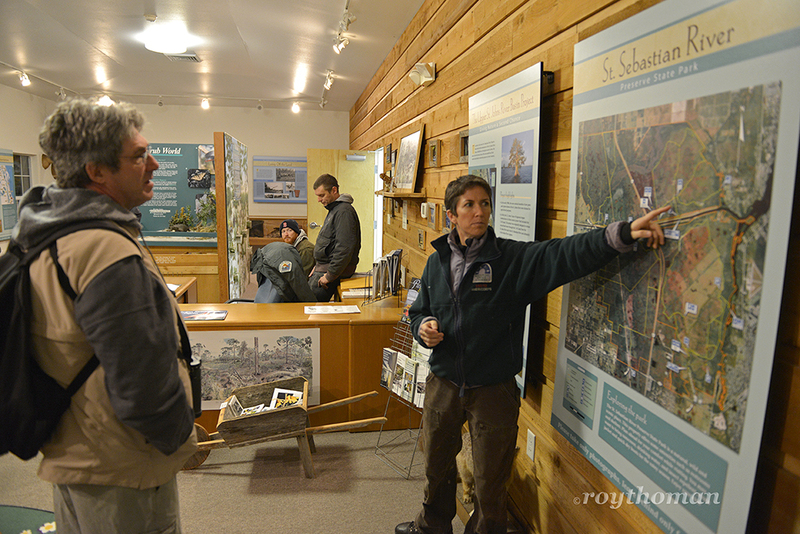 The first stop was the park visitor center to meet our guides and resident experts, Samantha McGee from the St. Sebastian River Preserve State Park (SSRPSP) and David Simpson of Birding with David Simpson. Samantha gave us an overview of the park and some information about the birds we would be seeing. The great thing about the SCBWF field trips is not only the very knowledgeable guides that take you right to the birds, but the festival makes special arrangements with the locations to give you VIP access. The SSRPSP doesn’t normally open until 8:00 am. We were there much earlier! Also, we were transported in State Park vehicles to locations in the park that you would otherwise need to see on foot. That saved us a several mile hike. This field trip leaves so early in the morning, because the Red-cockaded Woodpeckers leave their nest cavities so early in the morning. Samantha is pointing out several tree cavities as we wait for the birds to emerge. It’s worth the wait, as the woodpeckers emerge, they perch on an adjacent tree and showoff for us. Watching the woodpeckers chasing each other from tree to tree as the sun rises above the horizon. They put on quite a show for us. Taking time out to photograph a nice Florida landscape. 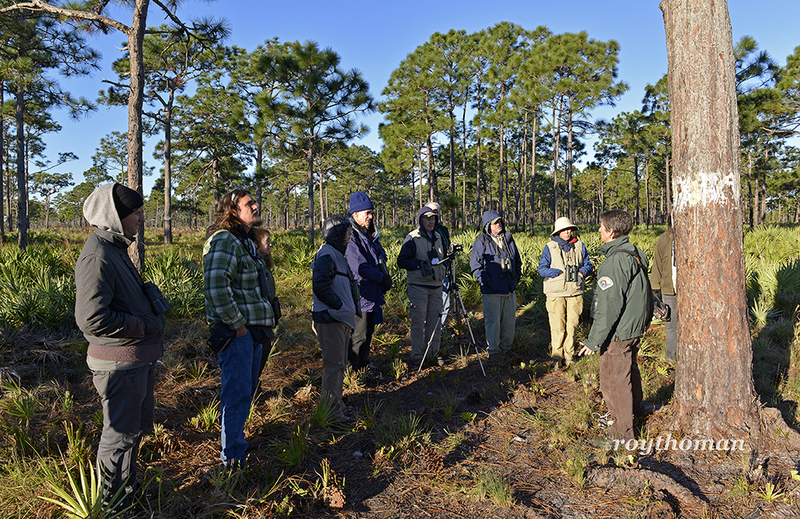 David Simpson, in the plaid shirt,of Birding with David Simpson helping out with bird identification. The Red-cockaded Woodpeckers (RCW) are a highly managed bird. 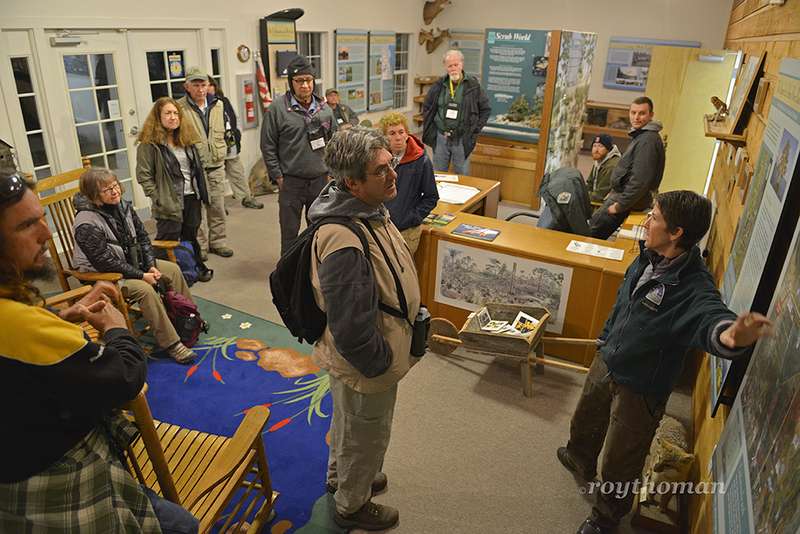 Park biologists keep an eye on all of the RCW’s in the park. Here, Samantha McGee is explaining how they manage the RCW population. 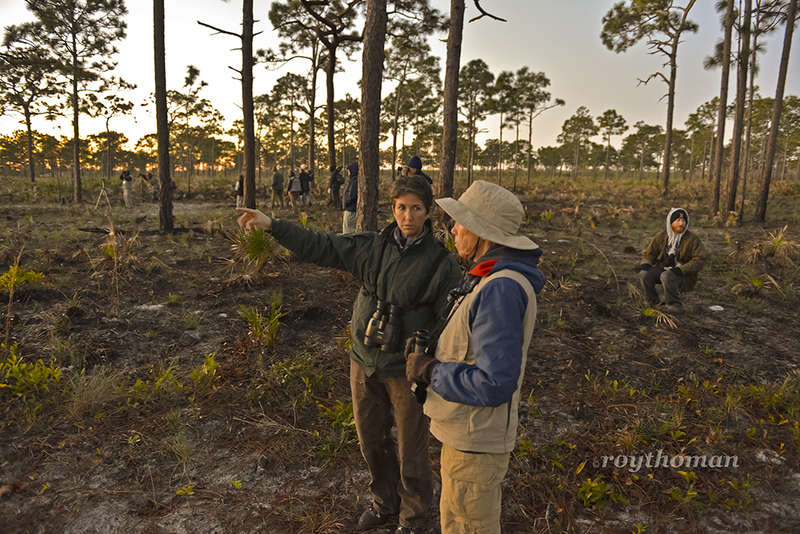 The RCW use live, long leaf pines to build their nest cavities. Most other woodpeckers will use any dead tree to make a nest cavity. This makes the RCW a very habitat specific bird. This is why preserving habitats like the SSRPSP is so important! Park biologists have been helping by making nest cavities for the RCWs. It can take over a year for a pair to create their own nest cavity, so they are very happy to move into the man made nest cavities. All of the long leaf pines with nest cavities are marked with a white band around the tree trunk. There are several young birds in the park that have nest cavities ready and waiting. They just need to find their mate, move in, and start their own families. Thanks to Samantha and her colleges, the RCWs here are doing well for now. It is a very fragile situation and could go one way or another at any time. 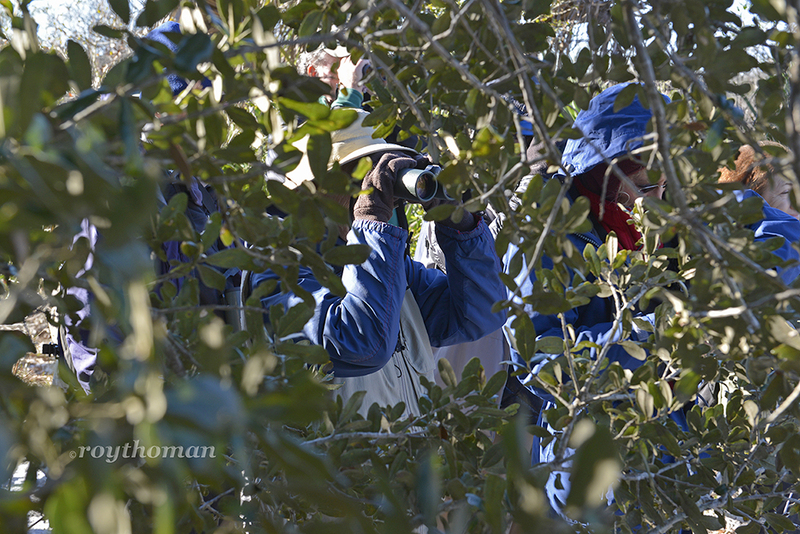 Peeking through the scrub oaks watching a family of Florida Scrub-Jays. The Red-cockaded Woodpeckers are not the only habitat specific bird that the SSRPSP manages. The Florida Scrub-Jay is another bird that needs a very specific habitat to survive. They will only survive in a scrub oak habitat. The scrub oaks need to be of a certain height and density. If the scrub is too short the birds will not move into the area. If the scrub grows too tall the birds will move out. The health of the scrub habitat is managed by fire. The scrub habitat is burned periodically to maintain the height and density. Scrub-Jays are interesting birds. They work together as a family group to protect each other from predators. The one predator they can’t protect each other from is the loss of their habitat. Sometimes when you are out in the field birding, you never know what rare or unusual bird you’re going to encounter. 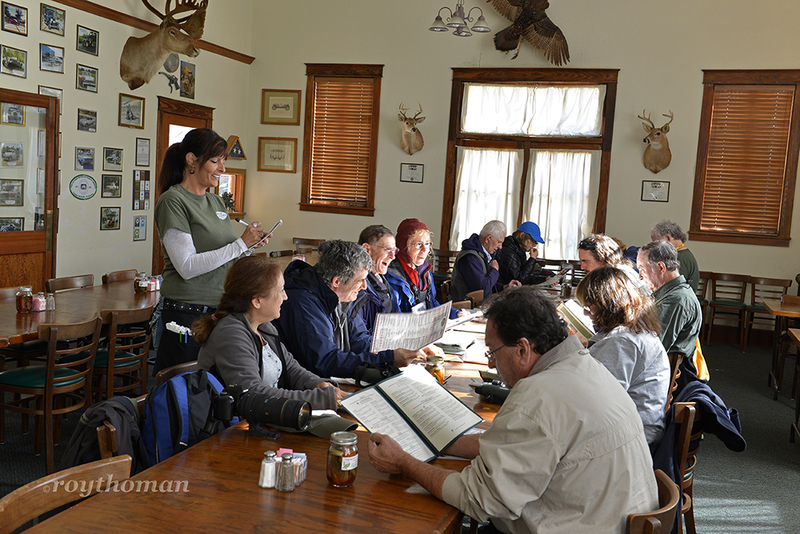 There is no better way to cap off a great day in the field than lunch at the Marsh Landing Restaurant. It was nice listening to everyone’s birding stories. The food was great too! Once you finally make a decision between all of the great things on the menu. My photos would look great hanging on your wall!